Not to be confused with Greater Poland Voivodeship. For other uses, see Greater Poland (disambiguation). 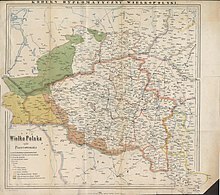 Greater Poland, often known by its Polish name Wielkopolska ([vʲɛlkɔˈpɔlska] ( listen); German: Großpolen, Latin: Polonia Maior), is a historical region of west-central Poland. Its chief city is Poznań. The boundaries of Greater Poland have varied somewhat throughout history. Since the Middle Ages, the proper (właściwa) or exact/strict (ścisła) Wielkopolska (often referred to as ziemia, meaning "land") included the Poznań and Kalisz voivodeships. In the wider sense (as dzielnica, i.e. region), it encompassed also Sieradz, Łęczyca, Brześć Kujawski and Inowrocław voivodeships (more eastward). One another meaning (as province) included also Mazovia and Royal Prussia. After the Partitions of Poland, Greater Poland was often identified with the Grand Duchy of Posen. The region in the proper sense roughly coincides with the present-day Greater Poland Voivodeship (Polish: województwo wielkopolskie). Because Greater Poland was the settlement area of the Polans and the core of the early Polish state, the region was at times simply called "Poland" (Latin Polonia). The more specific name is first recorded in the Latin form Polonia Maior in 1257, and in Polish ("w Wielkej Polszcze") in 1449. Its original meaning was the Older Poland, as opposed to Lesser Poland (Polish Małopolska, Latin Polonia Minor), a region in south-eastern Poland with its capital at Kraków which became the main center of the state later. Greater Poland comprises much of the area drained by the Warta River and its tributaries, including the Noteć River. The region is distinguished from Lesser Poland with the lowland landscape, and from both Lesser Poland and Mazovia with its numerous lakes. In the strict meaning, it covers an area of about 33,000 square kilometres (13,000 sq mi), and has a population of 3.5 million. In the wider sense, it has almost 60,000 square kilometres (23,000 sq mi), and 7 million inhabitants. The region's main metropolis is Poznań, near the centre of the region, on the Warta. Other cities are Kalisz to the south-east, Konin to the east, Piła to the north, Ostrów Wielkopolski to the south-east, Gniezno (the earliest capital of Poland) to the north-east, and Leszno to the south-west. An area of 75.84 square kilometres (29.28 sq mi) of forest and lakeland south of Poznań is designated the Wielkopolska National Park (Wielkopolski Park Narodowy), established in 1957. The region also contains part of Drawa National Park, and several designated Landscape Parks. For example, the Rogalin Landscape Park is famous for about 2000 monumental oak trees growing on the flood plain of the river Warta, among numerous ox-bow lakes. Greater Poland formed the heart of the 10th-century early Polish state, sometimes being called the "cradle of Poland". Poznań and Gniezno were early centres of royal power, but following devastation of the region by pagan rebellion in the 1030s, and the invasion of Bretislaus I of Bohemia in 1038, the capital was moved by Casimir I the Restorer from Gniezno to Kraków. In the Testament of Bolesław III Wrymouth, which initiated the period of fragmentation of Poland (1138–1320), the western part of Greater Poland (including Poznań) was granted to Mieszko III the Old. The eastern part, with Gniezno and Kalisz, was part of the Duchy of Kraków, granted to Władysław II. However, for most of the period the two parts were under a single ruler, and were known as the Duchy of Greater Poland (although at times there were separately ruled duchies of Poznań, Gniezno, Kalisz and Ujście). The region came under the control of Władysław I the Elbow-high in 1314, and thus became part of the reunited Poland of which Władyslaw was crowned king in 1320. More successful was the Greater Poland Uprising of 1806, which led to the region's becoming part of the Napoleonic Duchy of Warsaw (forming the Poznań Department and parts of the Kalisz and Bydgoszcz Departments). However, following the Congress of Vienna in 1815, Greater Poland was again partitioned, with the western part (including Poznań) going to Prussia. The eastern part (including Kalisz) joined the Russian-controlled Kingdom of Poland, where it formed the Kalisz Voivodeship until 1837, then the Kalisz Governorate (merged into the Warsaw Governorate between 1844 and 1867). Following the end of World War I, the Greater Poland uprising (1918–19) ensured that most of the region became part of the newly independent Polish state, forming most of Poznań Voivodeship (1921–1939). Northern and some western parts of Greater Poland remained in Germany, where they formed much of the province of Posen-West Prussia (1922–1938), whose capital was Schneidemühl (Piła). Following the German invasion of 1939, Greater Poland was incorporated into Nazi Germany, becoming the province called Reichsgau Posen, later Reichsgau Wartheland (Warthe being the German name for the Warta river). The Polish and Jewish population was classified by Nazis as subhuman and subjected to organized genocide, involving mass murder and ethnic cleansing, with many former officials and others considered potential enemies by the Nazis being imprisoned or executed, including at the notorious Fort VII concentration camp in Poznań. Poznań was declared a stronghold city (Festung) in the closing stages of the war, being taken by the Red Army in the Battle of Poznań, which ended on 22 February 1945. 1. Poznań 548,028 Poznań Greater Poland Former capital of Poland, former royal city of Poland, historical capital of Greater Poland. 2. Kalisz 103,997 Kalisz Greater Poland Former royal city of Poland, former voivodeship capital. 3. Konin 77,224 Kalisz Greater Poland Former royal city of Poland. 4. Piła 74,609 Poznań Greater Poland Former royal city of Poland. 5. Ostrów Wielkopolski 72,890 Kalisz Greater Poland Former private town of the Przebendowski family. 6. Gniezno 69,883 Kalisz Greater Poland Former capital of Poland, former royal city of Poland, ecclesiastical capital of Poland. 7. Leszno 64,589 Poznań Greater Poland Former private town of the Leszczyński family. 8. Swarzędz 31,084 Poznań Greater Poland Former private town of the Grudziński family, part of the Poznań metropolitan area. 9. Luboń 30,676 Poznań Greater Poland Part of the Poznań metropolitan area. 10. Śrem 30,152 Poznań Greater Poland Former royal city of Poland. 12. Krotoszyn 29,397 Kalisz Greater Poland Former private town. ^ "Lista miast w Polsce (spis miast, mapa miast, liczba ludności, powierzchnia, wyszukiwarka)". polskawliczbach.pl.